Are you dreaming of owning your very own Tiny Heirloom but don’t know how to get started? In this article, we will touch base on how to get started with us and what one can expect from our design process, as we walk you through the steps to designing and building your very own custom home! Before we talk about the design process, let’s go over perhaps the most important step of all: contacting us! If you’re wanting to build your dream tiny home, you can click on the green button in the right top corner of the screen at any time. Clicking this will take you to a contact form where you can provide us with your name and the best way to get a hold of you, whether that be via Email or by phone! By filling out this easy form you’ll be able to tell us about what kind of home you envision, your personal needs and get a free personalized estimate! Once we’ve come in contact with one another, and you’ve decided you’re ready to build your perfect tiny home, we will get started with your personal design. Below are the steps to our design process and a description of what to expect! This is where it all starts! At Tiny Heirloom, we are all about working with our clients. We sit down together with a blank page before us and really think about your vision of what your perfect home should be. After all, this home is being built custom for you and should accommodate your every personal need and reflect your personal tastes, making your home every bit as unique as you are! After we’ve brainstormed and have a good feel for your vision, we will start looking at options for trailer lengths! This will determine a lot about your tiny home. Ultimately, you’ll decide what size tiny home is appropriate for you based on your lifestyle and preference, but we recommend designing the smallest home you can while still achieving what you’ve envisioned. When it’s all said and done, this will allow you to have your dream home with the most maneuverable and towable abilities. Things get even more exciting as we jump to the floor plan after choosing the desired trailer length! Using virtual 3D models, we will really start to bring your vision to life as we create rooms, kitchen layouts, stairs and even add personal touches/features that are unique to you. In this part of the design process, together we will think outside the box and use our creativity to accomplish your goals of however you are going to use your tiny home. After laying out the perfect floor plan we jump to the exterior architecture. We really try to combine the floor plan and architecture into one, as we believe you not only need to be proud of the way your tiny home looks, but it also needs to resemble your ideal home, inside and out! 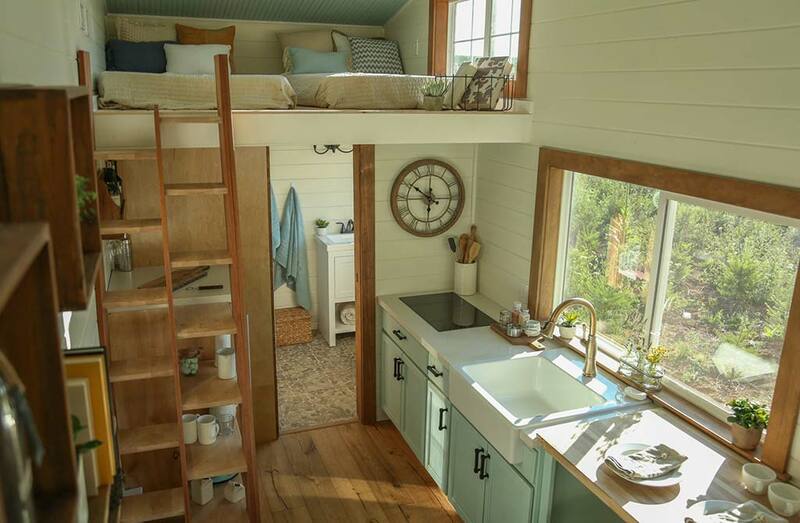 Congratulations, you’ve designed your dream tiny home! Now it’s time to build it! What started as an idea in your head will soon become a home that will provide you happy memories and security for years to come! Wasn’t that easy!? At Tiny Heirloom we strive to make designing and building a tiny home fun and easy for our amazing clients, and when you’re newly considering building a tiny home, you’re bound to have a lot of questions! Feel free to visit our FAQ’s page for some guidance and answers, and also keep following our blog posts for more insight. Thanks for reading, and we hope we get the chance to build you your dream home!